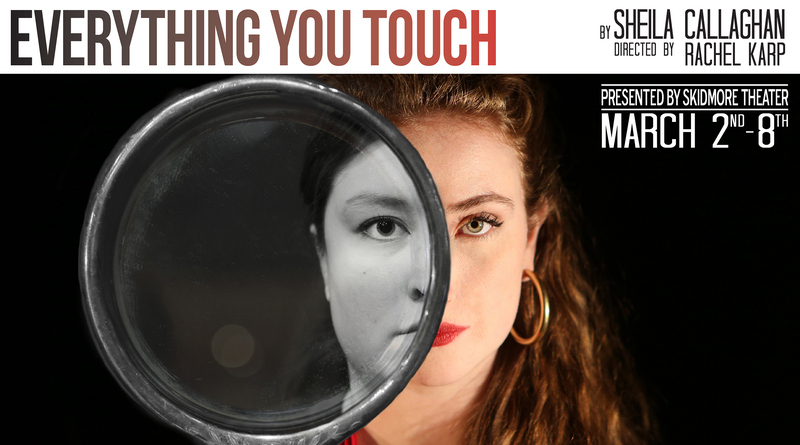 Skidmore Theater presents Everything You Touch by Sheila Callaghan, directed by Rachel Karp ’18. Featuring an all-student production team and a script by the writer of hit television show Shameless, Everything You Touch boldly takes on the timely issues of body image and the societal pressure for perfection in a darkly comedic world of fashion and fantasy. Two worlds unfurl simultaneously: the fashion world of the 1970s and contemporary Manhattan. Though separated by three decades, both are shaped by the desire for perfect careers, perfect bodies, and perfect lives. In the 1970s, Victor, a designer, and Esme, his muse, are immersed in their quest for beauty, art, and the ever-elusive idealized versions of themselves. That is, until Louella comes along, a shockingly ordinary woman from Arkansas who inspires Victor to cast Esme aside and make his clothing accessible to the people. In the present day, Jess embarks on a cross-country road trip to see her estranged, dying mother one last time, with a stranger named Victor who may or not be the imaginary reincarnation of her father. Along the way, she is forced to consider her own body-image, fraught with the self-hatred she has inherited from her mother and her world. Staff writer, Kallan Dana '19, covers the first seminar production of the Spring semester, Sheila Callaghan's "Everything You Touch." Join Leah Mirani on a tour at the Skidmore Theater Costume Shop, where she answers questions on her recent work! We've got a show! We've got a show! Happy opening to the cast and crew of our Spring Black Box Production, "Everything You Touch!" Curious what's in store? Check out this promo for a quick taste. Staff writer Em Miller '20, prepares audiences for director Rachel Karp '18's JKB Black Box production of Sheila Callaghan's "Everything You Touch."